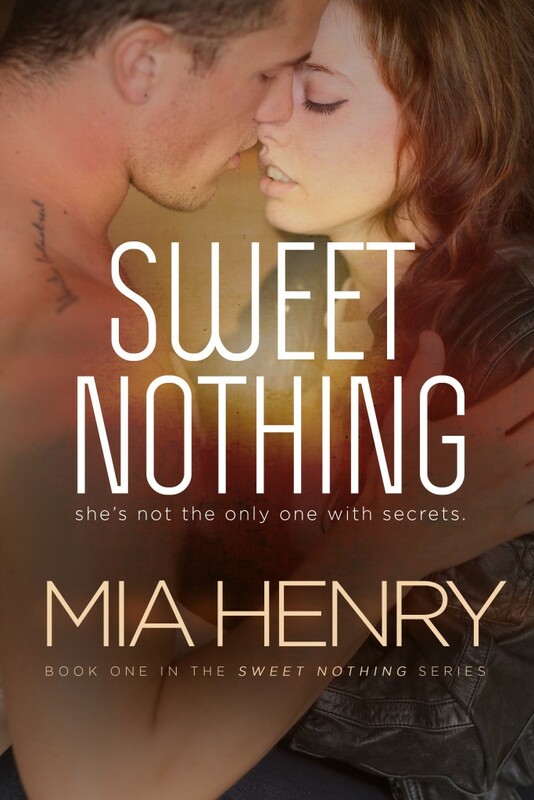 I’m excited to partake in this cover reveal for new author Mia Henry. Her debut novel, Sweet Nothing will be out December 12th! Check it out and make sure to go like her page on Facebook! It’s been two years, maybe three, since I’ve snorkeled, but my body slips naturally into rhythm next to Luke’s. My legs propel me through the cloudy blue of the surf. My breath marks the time in steady puffs. I stay slightly behind him, my head at his torso. I can feel my body beginning to relax, leaving tension and fear and doubt to bleed into the water with every stroke. I keep my head down, letting the patterns of light on the sandy floor lull me into a meditative state. Silvery fish dart at odd angles beneath us, making quick entrances and exits. I like feeling the warmth and safety of Luke’s body next to me without having to look for him. I like that he’s sharing this part of himself, this secret place that he’s kept for himself all these years. I like that he trusts me with it. If he’s starting to trust me, starting to open up, why can’t I do the same? It’s not like he’s naïve. He’s experienced tragedy in his own life. He knows that families can be destroyed in an instant. But even as the thoughts flicker through my mind, I know that our situations aren’t the same. Luke’s family was killed in an accident, in circumstances completely out of their control. Mine exploded because of the things I did to betray my father. Luke’s said so many times that family is important to him. What would he think of me if he knew the role I’d played in destroying mine? I feel Luke reach for my hand. With a single, swift kick, my body is next to his, my slippery skin grazing his torso. He intertwines his fingers with mine and squeezes. I squeeze back, tiny shivers running from my scalp to the tips of my toes. It’s unbelievable how he can turn me on with a single touch. We swim side-by-side, fingers laced tight, until Luke slows and motions for me to look straight ahead. Just a few feet away looms the remains of a shipwreck. Despite the decades it’s been since the wreck, the sailboat still manages to look intact. Luke catches my eye, and I know what he’s trying to say. Together, we gulp deep breaths and kick beneath the surface. He leads me around the boat’s perimeter, pointing out a plaque on the ocean floor that commemorates the wreck. I drag an index finger across the sandy bottom, tracing our initials. Around us, cobalt and chartreuse fish glide from bow to stern. I hold my breath until it feels like my body’s going to explode, then kick to the surface and blow the saltwater from my snorkel. Luke rises soon after me, then tears off his mask and lifts his head above water. I do the same. “Pretty cool, huh?” He tosses his head to one side, sending his wet curls flying. A lump forms in my throat, and I can feel tears gathering. I hold my breath and let myself fall beneath the water line, allowing a few tears to slip out before I resurface. “Tired? Out of breath? Need to tug your ear?” he teases, pushing my bangs off my forehead. “Never!” I shriek, even though my legs are starting to ache. “Come here.” Luke reaches for me, his strong arms encircling my waist. I can feel his legs churning beneath the surface. I drape my arms over his shoulders and wrap my legs around his torso. Our bodies rise and fall together in the water, our lips close. Cupping the back of my neck with his palm, he lifts his mouth to my ear. I liked the excerpt. I most definitely will be reading this debut book of Mia Henry. Thanks for the chance to enter this giveaway.